SOUTHAMPTON, ENGLAND--(Marketwire - Sep 7, 2012) - It's "Your Day, Your Way" for those taking advantage of an exceptional wedding venue in Southampton, UK where attention to detail and four-star amenities combine to make dreams come true. Covering 225 acres of the pristine Hampshire countryside, the sophisticated Meon Valley, A Marriott Hotel & Country Club has all the essentials for creating a dream wedding. And now, upon introduction of the hotel's impressive "Your Day, Your Way" wedding package, couples can personalise their day whether planning a stylish reception following a church wedding or utilizing the hotel's offering of elegant rooms licensed as civil ceremony venues in Southampton. This exclusive wedding package at one of the leading 4-star hotels in Southampton is available from just £2,495 and includes everything needed so couples can enjoy the property's scenic surroundings and elegant accommodations while focusing on each other and their guests. Included in the "Your Day, Your Way" package for 50 persons is a three-course wedding breakfast, a glass of sparkling wine for the wedding toast, reception room hire and use of a golf buggy so couples can easily capture special photographs across the club's rolling Hampshire countryside. Marriott certified wedding planners are also on staff to help coordinate events from start to finish, so even the smallest of details is perfectly executed. Couples can easily expand their day with added services such as chair covers, an evening buffet, guest accommodations, rounds of golf over the club's two phenomenal links, spa treatments at the hotel's Retreat at Meon Valley or choose from an endless list of additional wedding day amenities designed to allow couples the joy of a unique and perfect wedding with memories to last a lifetime. Upgraded extras are quoted on request and more information about the Marriott's impeccable Southampton, UK wedding venues is available by calling 01329 836 829. Rates for this exclusive package are available for weddings held January 1, 2013 through March 31, 2014 based on availability at the time of contract signing. Bank holidays, Christmas, Easter and Valentine's Day are excluded from the rate. Additional information may also be obtained by visiting the hotel website at http://www.marriott.com/hotels/travel/sougs-meon-valley-a-marriott-hotel-and-country-club/. 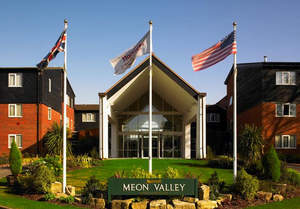 Meon Valley, A Marriott Hotel & Country Club, while providing guests with secluded accommodations and a scenic coastal getaway, is conveniently situated just minutes from Southampton Airport, making it an ideal choice for both business and leisure travelers. As guests of one of the premier hotels in Southampton, UK, travelers can expect only the finest in guest satisfaction, gracious accommodations and attentive service. Award-winning dining at the Broadstreet Restaurant is also available for breakfast and lunch, while the Zest Restaurant, Bar and Lounge is open throughout the day for a warm and relaxed dining atmosphere. Covering 225 acres of the pristine Hampshire countryside, the sophisticated Meon Valley, A Marriott Hotel & Country Club has all the essentials for creating a dream wedding.